On a fine spring evening at the end of April 2012 , the sun was low in the sky. I was in Baltinglass and had thought I would get a shot of the river flowing towards a sunset, That was the plan. I walked down a pathway from the bridge in the town looking for a suitable location. I turned to walk back and spotted this lad under the bridge. He stopped me dead in my tracks. I already had the camera mounted on a tripod and so very gently, with no sudden moves that might spook him,I set up the camera. I had a 150mm lens and a circular polariser. 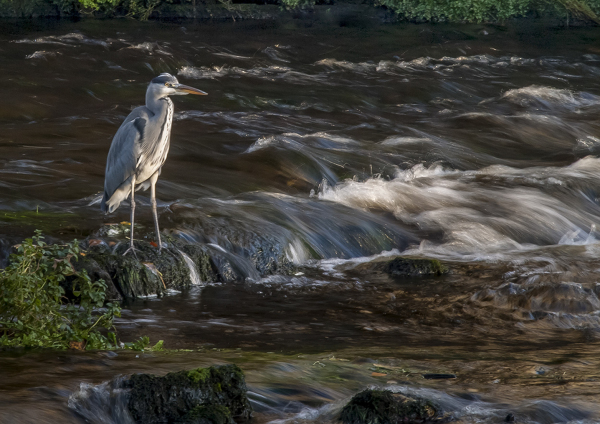 The light under the bridge was quite dark but the front of the heron was bright as the setting sun illuminated him. Using the camera meter to get the correct exposure, I snapped about 3 or 4 shots. Then I took a few more steps towards him, as a 150mm lens was never going to be close enough. Again I took a few more shots, checked the exposure that now looked a bit dark, so I decided to slow the shutter speed down to allow more light in. This also changed the texture of the water. Again I moved a few steps closer and tried to get a few more shots off at even slower speeds. They didn't work out as well and were over-exposed, showing some movement. Herons may look perfectly still when they stand patiently hunting for fish, but they sway very slightly, and long exposures show that movement. Luckily, I still got one decent shot out of about 30 or so - not a bad result. Members: If you have an interesting shot that you would like to tell us about, then email it to us for pubication on this weekly page.